When you compete in a crowded marketplace, you need every advantage you can get. Having a great product just isn’t enough anymore. You need a great package design, a strong image, and the exact right words on your cosmetic label to inform and persuade your customers. You also need to be sure you’re adhering to the labeling guidelines and regulations for the countries and states where you sell. With lots of competing requirements, balancing them can be tricky. Understanding how you want to express your brand is the first step in creating your labels and retail packaging. One choice you can make is to embrace the concept of full disclosure as a competitive edge. They read labels, research online, and make choices for themselves and their families based on their own values. Consumers want to trust the brands they buy, and full disclosure as a brand value can help sway consumers to your product over your someone else’s. Committing to giving your customers complete information about your product also means avoiding language and labels that confuse or mislead. A quick search on Amazon will bring up hundreds of skincare products making drug claims about how a certain cream will “cure X” and how a certain oil will “remove Y”. These claims are often unsubstantiated and misleading, and unless they are made on an over-the-counter drug, are not allowed on your cosmetic label, per FDA guidelines. You’ll also see many products claiming to be “organic” but not using the USDA Certified Organic green and white logo. The word ‘organic’ is a regulated term here in the US and a label without the USDA Certified Organic logo most likely means the product is not USDA Certified Organic with all the verification and validation that program requires. Other words and phrases, like “100% Pure” and “All Natural” can also cause confusion with the consumer; lawsuits and fines are now being brought against companies who make poor word choices. These restrictions don’t mean you can’t celebrate the natural ingredients on your label and you can’t share what wonderful, amazing qualities your product has for beautifying your skin and hair. For instance, our Hemp Acai Body Butter is great for soothing dry hands and reducing the appearance of fine lines. We market the body butter by saying “Creamy and rich, Certified Organic Hemp Acai Body Butter is the perfect solution for soothing dry or mature skin.” We don’t use any words to imply it does more than beautify. Power tip: Words and phrases such as vegan, plant-based, naturally derived, locally sourced, and “free-from” statements, such as gluten free, sulfate free, paraben free, etc., can be great word combinations to get your message across without misleading your consumer. If you qualify, add Leaping Bunny, NON-GMO and other seals of approval to quickly convey your company values. As defined in section 201(i) of the FD&C Act, a cosmetic is a product, except soap, intended to be applied to the human body for cleansing, beautifying, promoting attractiveness or altering the appearance. In short, one may say that a cosmetic is a product intended to exert a physical, and not a physiological, effect on the human body. The raw materials used as ingredients of cosmetic products are by law also cosmetics. Creating full disclosure labels doesn’t mean you have to be boring. In fact, you get to really put your creative brain power to work. When you create a product description for your label, use competitive research, the ingredients themselves, the product benefits, and your company’s values to give you a creative pool of words and phrases. Use these words to set your product apart. You can be clear, transparent, and effective in your marketing if you invest time to really explore how to position your product. Use focus groups to help you. Experiment with phrases and benefit statements. See what really lights people up. The label not only gets your product off the shelf, but it resells your product with every use. As you finalize your ingredient deck, logo, label design, product packaging, and marketing copy, keep the FDA guidelines in mind. A Compliance Corner blog from last year gives you some additional details and resources, including links to the Food, Drug, and Cosmetic Act. Once everything is to your liking, we recommend the key steps to take before you go to final print. Ask your manufacturer to give you a compliance review. We do that free of charge for our private label customers and is a service you should expect. We’ll give you our opinion about whether or not your label meets FDA and FD&C guidelines, and if applicable, USDA Certified Organic and Oregon Tilth requirements. Take time to create some sample packaging to give to friends and family, or special customers. Ask for honest and constructive input and feedback. Create a matrix and ask everyone the same questions. You can put three or four versions out and see who gravitates to which version. Companies like GutCheck can help you get fast and affordable market research, which can help you create better marketing materials, including your label. When you think you have a winner or two, take your sample packages to a retail location where you want to sell, such as Whole Foods or your local spa. Picture your product on the shelf. Is the packaging popping? Does your label stand out? 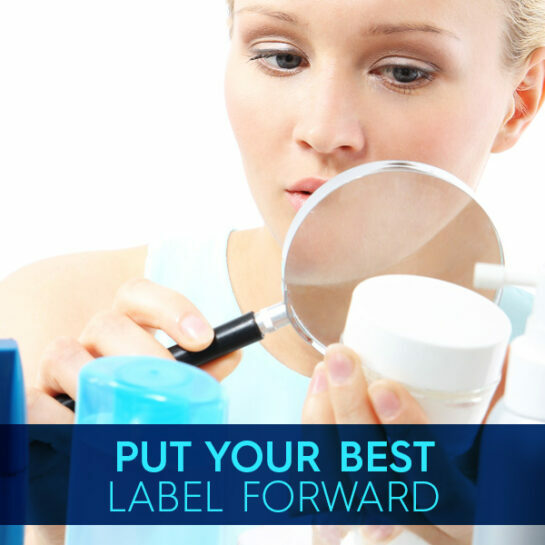 Does the label represent your product in the best light? Are you disclosing everything you want to disclose, including vegan, gluten free, sulfate free, etc. What are your competitors claiming? If you see competitors who are not fully disclosing or are making claims, you can talk about your commitment to full disclosure. When you’re satisfied you’ve got the label you want, it’s time to go to print. We like working with Leaping Lizards, Lightning Labels, Sticker Giant, and Frontier Label for professional-looking labels at reasonable costs. Get some sample stock and see what you think. Talk with the label experts about the material, finish, and size. You’ll want different material for tubes than for jars. You’ll want different material for products that get used in the shower than in the gym bag (think silk screening here if you have a big enough order). Don’t let the actual execution of your label undermine all your work in getting the right design, the right words, and the right ingredients in your product. Power tip: Creating a custom die cut for your labels can add days to your order. Be sure to discuss with your label rep so you know how to plan. As always, Essential remains committed to providing our customers with complete information about our products and the ingredients we use. Feel free to reach out to us via email at info@ewlnatural.com or by telephone (1-866- 252-9639) if you have any questions!